Merry X-mas Pinkeep This item is on sale. FROM STORE OVERSTOCK, NEVER USED...From Thistles, shown on 32ct linen with a stitch count of 120 x 120 using Gentle Art Sampler Threads (or DMC floss). Mes Travaux d'Aiguilles - My Stitching This item is on sale. FROM STORE OVERSTOCK, NEVER USED...From Cmon Monde, with a stitch count of 76 x 96 and shown stitched on 40ct Natural linen using Gentle Art Sampler Threads, Belle Soie silks and DMC floss. The tiny 'hoop' is included. Message For You, A This item is on sale. From Kount On Kappie, out of print chart is in EXCELLENT condition, appears never used, with minimal writing on front and inside covers, and price sticker on back cover. Metal Magic Pin and Earrings This item is on sale. FROM STORE OVERSTOCK, NEVER USED...From Whiskey Creek, out of print chart is in EXCELLENT condition, with no markings of any kind and price sticker on front cover. Hardware is included. Miaou This item is on sale. FROM STORE OVERSTOCK, NEVER USED, chart is in EXCELLENT condition...From Tom & Lily Creations, stitched on Natural linen using DMC floss. Stitch count is 99 x 56. Midnight Medley This item is on sale. FROM STORE OVERSTOCK, NEVER USED...From Freda's Fancies, stitched on 32 count Mystic linen from Picture This Plus using Caron Waterlilies #044 - Ice and Kreinik Blending Filament #032. Stitch count is 162 x 63. Midwinter This item is on sale. FROM STORE OVERSTOCK, NEVER USED...From Monsterbubbles, out of print chart is in EXCELLENT condition, with no markings of any kind with no markings of any kind and price sticker on protective plastic cover. Milady's Sampler Pendants I This item is on sale. FROM STORE OVERSTOCK, NEVER USED...From Milady's Needle, kit includes enough 36 count Pecan Butter linen and Gentle Art Sampler Threads to complete all four designs, and one pendant. Milady'sTravel Ort Box This item is on sale. FROM STORE OVERSTOCK, NEVER USED...From Milady's Needle, the chart pack comes WITH the 40ct Vintage Buttercream linen and Gentle Art Sampler Threads. With a stitch count of 40 x 35, you provide the plastic pin box (as found at JoAnn Fabrics). Minerva & Friends: Anna Kennedy 1854 This item is on sale. FROM STORE OVERSTOCK, NEVER USED...From Needlework Press, from their "Minerva & Friends, A Collection of Marking Samplers" reproduction series, stitched on 36 count Legacy linen from Picture This Plus using Au Ver A Soie, Belle Soie, Dinky Dyes, Gloriana, and NPI Silks. Stitch count is 104 x 197. Mini Block - Bingo This item is on sale. FROM STORE OVERSTOCK, NEVER USED...From Hinzeit and shown on 28ct White Jobelan using DMC floss with a stitch count of 41 x 81. All charms/embellishments used are included in the chart pack. Pictured in a Kay's Frame (Bingo Chip color may vary). Mini Block - Boating This item is on sale. FROM STORE OVERSTOCK, NEVER USED...From Hinzeit, a fast and fun series of Mini Block designs .. Stitch features each 'letter' of the word in a 'block' and a 'charm' in a block next to the letter. The chart INCLUDES the charms needed (7 silver charms: nautical motifs - charms may change due to availability) Stitched on 28ct White Jobelan using Sampler Threads and DMC floss - stitch count: 113 x 41. Mini Block - Florida This item is on sale. FROM STORE OVERSTOCK, NEVER USED...From Hinzeit and shown on 28ct White Jobelan using DMC floss with a stitch count of 113 x 41. All charms/embellishments used are included in the chart pack. Mini Block - Mermaid This item is on sale. FROM STORE OVERSTOCK, NEVER USED...From Hinzeit and shown on 28ct Star Sapphire Jobelan using DMC floss with a stitch count of 45 x 117. All charms/embellishments used are included in the chart pack. Pictured in a Kay's Frame ('shell' may vary as to what is available). Mini Block - Merry Christmas This item is on sale. FROM STORE OVERSTOCK, NEVER USED...From Hinzeit .. the stitched design features the holiday phrase spelled out in blocks with stitched santas & reindeer and gold tone bells and star charms at either side. Shown stitched on 28ct Antique White Jobelan using DMC floss with a stitch count of 43h x 147w. The handpainted frame is available as well. Mini Block - Sailing This item is on sale. Mini Block - Washday This item is on sale. FROM STORE OVERSTOCK, NEVER USED...From Hinzeit, a fast and fun series of Mini Block designs featuring each 'letter' of the word in a 'block' and a 'charm' in a block next to the letter. The chart INCLUDES the 7 charms needed for each letter block. Shown stitched on 14ct or 28ct Ivory using Weeks Dye Works or DMC floss. Stitch count: 43 x 115. Sage green frame with clothespin attachment is from Kay's Frames and was designed for this design. Mini Bock - Handyman This item is on sale. FROM STORE OVERSTOCK, NEVER USED...From hinzeit, chart is in EXCELLENT condition, with no markings of any kind and price sticker front cover. Charms are included. Mini Memories of Everyday This item is on sale. FROM STORE OVERSTOCK, never used, in EXCELLENT condition. From Glendon Place comes a series of charts designed with the Sudberry House 3" X 3" Mini Wooden Boxes. This particular category is generic in nature and contains everyday types of designs that can be displayed year-round with the 4 designs included. Be creative! If you like the design, but don't want to stitch it as a mini box, then stitch it on the fabric of your choice. Stitch it as an ornament, a hand towel, or for a mini frame! Shown on 22ct Hardanger fabric with a stitch count of 42 x 42 and uses floss. Mini Motif Designs - Country Vol 3 This item is on sale. From Graphworks Ltd, published 1986. Out of print chart is in EXCELLENT condition, appears never used, with minimal writing on inside cover (does not affect charted design). Includes 17 designs. Mini Motif Designs - Country Vol 6 This item is on sale. From Graphworks International, published 1987. Out of print chart is in EXCELLENT condition, appears never used, with no markings of any kind and price sticker on front cover. Includes 14 designs. 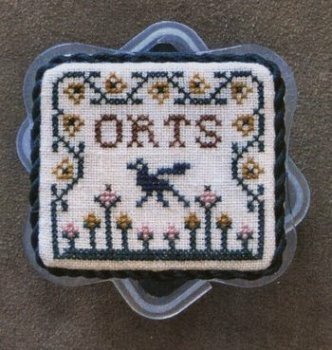 Mini Motifs This item is on sale. Mini Topiary Sampler 5 This item is on sale. Mini Vintage Stitches This item is on sale. FROM STORE OVERSTOCK, NEVER USED...From Jeannette Douglas Designs, to continue to challenge some beginner specialty stitch stitchers, she has taken elements from her Stitches series and made a smaller sampler! The Gloriana silk used is included. Mini Yuletide Messages This item is on sale. From Designs by Gloria & Pat, out of print chart is in EXCELLENT condition, appears never used, with no markings of any kind and minimal writing on front cover.